So you think you can't enjoy the delights of the sea as summer comes to an end? Come to the island of Krk in Octoberand you'll find out you're wrong. Even though autumn is yet to arrive, the weather forecast shows that temperatures will remain higher than average. So, summer's not over yet! And besides nice warm weather, the island has a rich cultural and historical heritage and numerous tourist attractions offering various options for an active and meaningful vacation. You'll certainly enjoy your time at one of the numerous attractive beaches on the island of Krk, but you can also relax by the pool at Dražica Hotel Resort, situated next to the beach. If you prefer to get away from the stress of a busy lifestyle by taking a few days of a healthy active vacation, why don't you rent a bike and explore the hidden parts of the island of Krk? Various walking and cycling routes lead from the town of Krk to the surrounding areas. You can get a map of cycling routes in tourist offices and at hotel reception desks. Plan your route and take the paved road or macadam path to explore the hinterland of the town of Krk. You can visit some historical attractions along the way such as the Franciscan monastery in Glavotok or the protected forest reserve with the church of St. Krsevan near Milohnic. And for those who want to enjoy an active vacation which includes comfortable accommodation, we recommend you to stay at hotel Dražica. The year-round offer of wine from the Vrbnik valley on the island of Krk, known for its authentic wine variety called Vrbička Žlahtina, represents a special attraction to the visitors to Kvarner and Krk. The wine cellars and taverns are offering all year round wine tasting experiences, selling wine and authentic homemade products. The island's gastronomic offer is quite rich, and can be sampled at Krk hotels. Come and experience it for yourself, taste delicious gastronomic specialties, a variety of refreshing cocktails and sparkling wines as well as Valomet – the luxurious sparkling wine from the sea. We recommend Valomet VIP Lounge packages at hotel Dražica. Among many cultural-historical sights, the Baska tablet (Croatian: Bašćanska ploča) at Jurandvor village, dating back to 1100, is the most important one. The tablet was written in Glagolitic script and represents an important testimonial of Croatian literacy. Other sights to see are the Franciscan monastery on the islet Košljun, the well-preserved medieval core of the town of Krk and many other. The Island of Krk abounds with historical monuments and is laden with history. All you need to do is discover it. 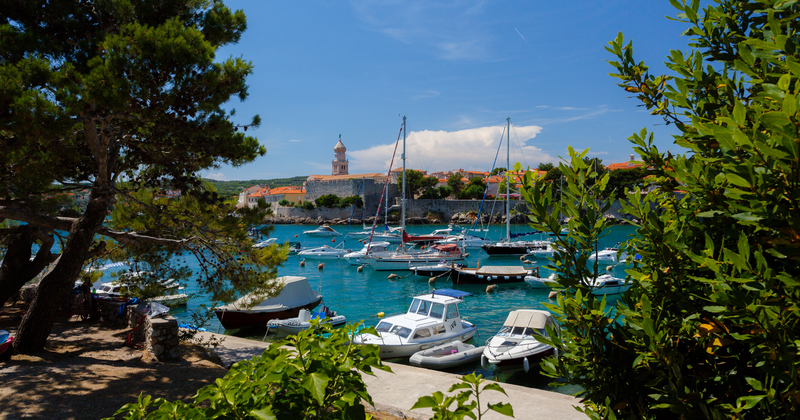 Beautiful beaches, breathtaking nature, the scent of the sea, the delightful old town of Krk… So romantic! So, have we convinced you that visiting Krk in autumn is a really good idea? We hope we have and you'll visit us soon! And don’t worry, you can make a booking in just seconds. A few clicks and you are here with us!